A new class of interactive whiteboard, the 800 series joins as the premium product of the SMART Board family, engaging learners in innovative and exciting ways. With a full dual touch surface, and supporting freestyle interaction, the SB880 allows for a truly collaborative experience. Common gesture recognition enhances natural and intuitive interaction, building on existing features of SMART touch technology, and bringing to an entirely new level. Epsons 3LCD Technology ensures high quality images with high White and Colour light output for vivid colours and bright images, even in daylight. 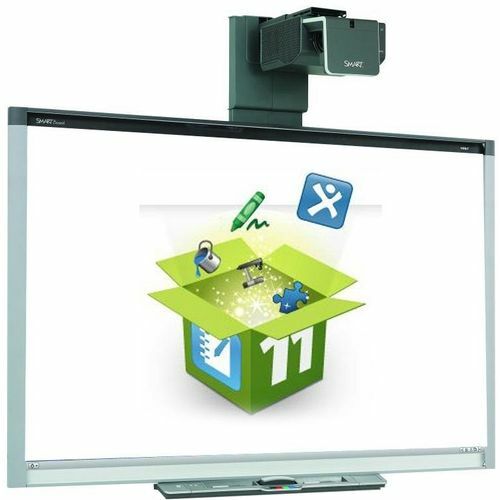 HDMI input means that students benefit from sharp, clear projected images. Lamp life up to 10,000 hours. The multi-PC projection software allows teachers and students to share their content simultaneously. Simply plug in and turn on - theres no warm up time. Wall mounting bracket included in the box. This suite gives you the worlds best education software to connect students, teachers and devices. SMART Learning Suite lessons are hands on, collaborative learning experiences on any device. Software includes SMART Notebook, SMART Lesson Activity Builder and SMART Amp. SMART Board interactive whiteboard systems come with SMART Notebook collaborative learning software, which sets the standard for creating, delivering and managing interactive lessons within a single application. It puts all your instructional materials at your fingertips, and allows you to save any notes or content you write during the lesson to share with students later on. A powerful and easy-to-use application, SMART Notebook software enables you to readily deliver interactive lessons that help keep your students engaged and interested. It provides a common platform for linking classroom technologies and student devices. Warranty: Get a 3-year warranty on the EB-570 projector. The SMART Board interactive whiteboard has a 2-year warranty, which is extended to 5 years upon product registration.